Thanks to Monmouth's game notes and the Asbury Park Press, which is the source of all of this research. "At today's football game against Lehigh and tonight's men's soccer game against UMBC members of the Monmouth athletics community will be collecting clothing to be sent to those affected by Hurricane Harvey," Monmouth's game preview says. One thing that might be another narrative in this weekend's game on the Monmouth side is that while the Hawks have won their last two games against Lehigh, both wins came at Murray Goodman Stadium. Monmouth has never beaten Lehigh in a home game, though they came very close in 2013 in a 28-25 defeat. In that game, down 25-21, speedy Monmouth CB Tevrin Brandon blocked P Tim Divers' punt - the ball deflecting almost straight up, then falling back down to earth behind the line of scrimmage, where alert FB Zach Hayden kept calm, grabbed the ball out of the air, and started to go for the first down marker. It set up Lehigh's decisive touchdown. 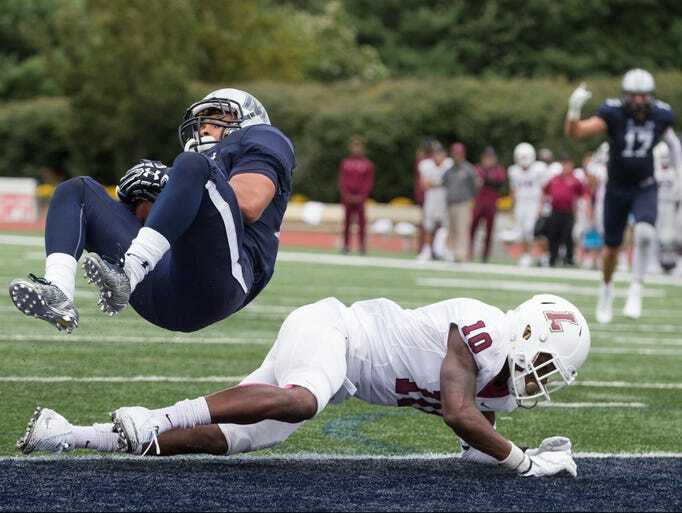 In fact going back to 2012, the last four contests have been decided in the fourth quarter - in the 2012 contest, Monmouth was down 20-17 when an interception return for touchdown and extra point made the final tally 10 points. So Lehigh is used to dogfights from Monmouth - and even in their two wins, have barely held on to claim victory. Monmouth does most of its damage on offense thanks to a pistol spread attack that focuses on the run a bit more than the pass, but is versatile. Behind a veteran offensive line with an NFL pro prospect, head coach Kevin Callahan isn't a guy that plays at a blistering pace - he's very happy playing a slow, old-fashioned game with the time of possession squarely in Monmouth's favor. He beat Lafayette last week with 69 plays on offense, and holding onto the ball for 31 minutes to Lafayette's 28. Monmouth's quarterback is sophomore QB Kenji Bahar, who started the last few games of 2016 for the Hawks and started last week against Lafayette, who went an efficient 22-for-30 passing for 243 yards and 1 touchdown, but threw two interceptions. He's been mostly a pocket passer for Monmouth in practice, but he has the ability to take off with the ball at times. Helping Bahar is that Monmouth seems to always grow fantastic receivers on trees, as evidenced by NFL veteran WR Miles Austin and current productive TE Neal Sterling, both of whom competed against Lehigh in their collegiate careers. WR Chris Hogan, who didn't compete against Lehigh, is a pretty good receiver too, if you remember last year's Super Bowl. Senior WR Reggie White, Jr., isn't related to that Reggie White, but he is the son of the former NFL player named Reggie White who played for the San Diego Chargers and played in Super Bowl XXIX. Junior White had a monster day for the Hawks against Lafayette, catching 8 balls for 120 yards and catching Bahar's lone touchdown pass, establishing him as his go-to receiver. After White, Bahar has spread the ball around to a variety of different receivers, most notably 6'5, 240 lb sophomore TE Jake Powell, who had 4 catches for 46 yards last week. Rounding out the receiving corps last week was 5'7, 175 lb senior WR Vinny Grasso and speedy 5'9, 180 lb junior WR Matt Castronuova. 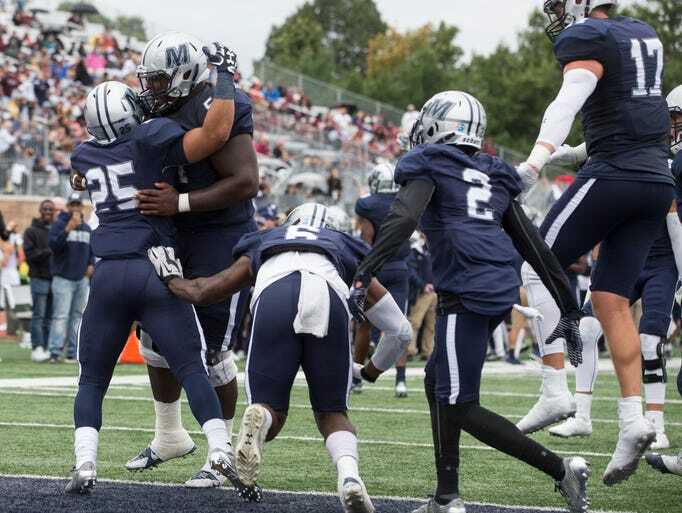 Monmouth's offense thrives on a stable of rushers that don't turn over the ball and can be workhorses out the backfield, with the ability to catch the football on bubble screens and designed short passes to move the sticks. 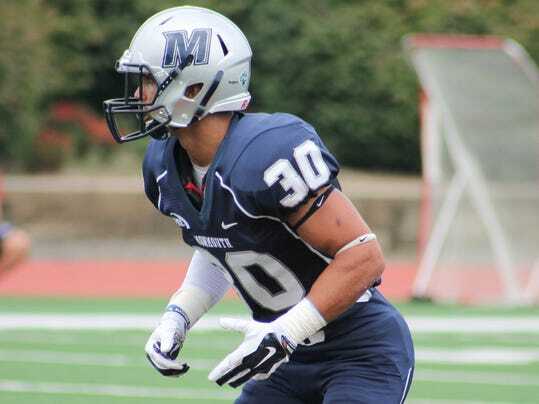 Last week Monmouth saw the emergence of freshman RB Pete Guerrerio, who exploded onto the FCS scene with 139 yards rushing, 16 yards receiving and 2 rushing touchdowns. 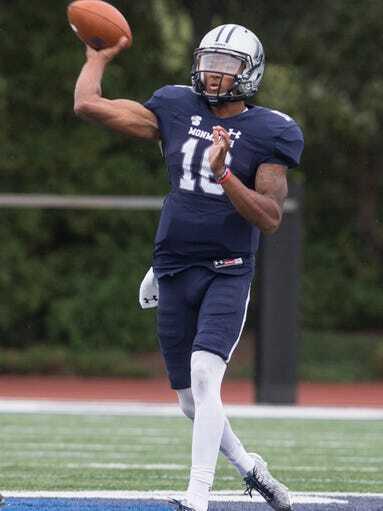 He was Big South Freshman of the Week due to his performance, and thus answering one of Monmouth's biggest offseason questions as to where their offense might come from. Even one game in, the 5'10, 195 lb tailback going to be a point of emphasis of Lehigh's defense for sure. When Guerrerio is taking a breather or it's 3rd and short, senior RB Mike Jolly, who will get rotated in often, comes in. Jolly is no slouch: he can catch the ball out of the backfield and can be a battering ram where necessary. Helping Monmouth immensely is the fact that they have a talented, experienced offensive line anchored (literally) by an NFL prospect at center. 6'4, 295 lb senior OL Alex Thompson and his group allowed RB Lavon Chaney last season to net 810 yards rushing and paved the way for 26 rushing touchdowns. Thompson, and the Monmouth offense, is looking to carve out more holes this season to allow for more rushing success and rushing touchdowns this season, too, and based on last week's performance, they're off to a really strong start in that department. Monmouth's base 4-3 defense's strength, unfortunately, plays right into Lehigh's strength in running the football. The Mountain Hawks' rushing attack will be trying to gain its ground against a team that has always been very strong in that area historically, and has been a way for the Hawks to steal wins against very good teams. Lafayette last week ended with -1 yards rushing. What makes this more remarkable is that Monmouth's D line graduated several seniors - so it was players in their first game action that shut down Lafayette so resoundingly. 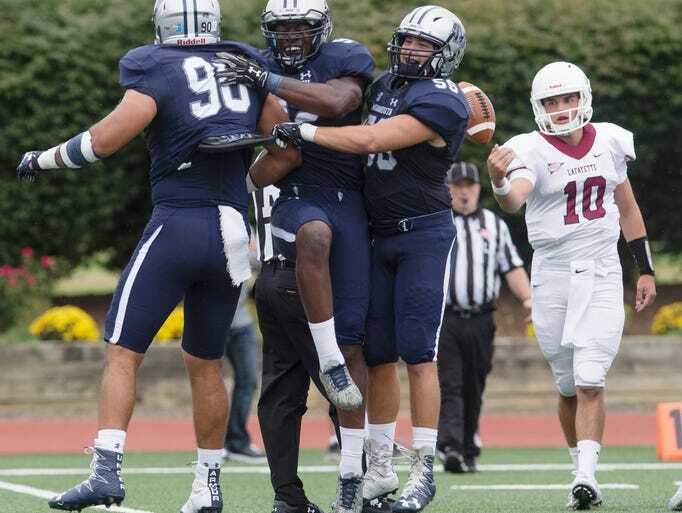 Monmouth has two enormous defensive tackles: 6'6, 255 lb senior DT Manny Maragoto and 6'1, 295 lb junior DT Gerron Pendarvis, which challenges teams that try to run up the gut against them. Additionally, 6'3, 220 lb sophomore DE Kelly Scarlett (1 sack) and senior DE Daivione Thomas provided good pressure on Lafayette's QB last week as well. Even while they're breaking in a bunch of new faces, this is a formidable unit. At linebacker, Lehigh might have caught a break, as senior LB Agbai Iroha, who had a monster game last week, is not listed on the depth chart after suffering an injury last week. Senior LB Christian Runza will take his place, who didn't see any game action last week, where he'll join sophomore LB Evan Powell (2 tackles) and junior LB Diego Zubieta (5 tackles 1/2 sack). The best athlete on the team might be senior SS Mike Basile, who has made a multitude of preseason all-America teams this preseason again and is another bona-fide NFL prospect. The 6'1, 200 lb defensive back, it is more of a linebacker-esque sort of safety like S Steve Atwater used to be. Lehigh backs and receivers will have to keep an eye out for No. 30 at all times. "As the past two years have gone, I've grown more as a player," he said at last year's Monmouth's media day. "I don't think I was ready to be a leader at all my first two years here, so I really believe I can be a leader of this team. I really believe that. I can help everyone on the team. I can bring my knowledge and what I know, my experiences and really bring it down to the younger guys, the older guys, everyone. This team can really come together and we can really win some games this year." Last season he proved that in spades, being one of the FCS leaders in interceptions, and his leadership will continue to make Monmouth's defense tops in the Big South. Last week, he had an interception, picking up right where he left off last year. Senior CB Kamau Dumas, who spent some time on offense on Monmouth in the past, starts at corner, and junior CB Tymere Berry, who returns as starter after sitting out most of 2016, is on the other side. Senior FS Teddie Martinez, who also had an interception last week, rounds out the unit. Monmouth's special teams have historically always been strong and also boast a ton of speed in the return game. Senior P/K Matt White had three punts last week for a 35.7 yard average, but don't let that fool you - White is an excellent kicker that nailed a 46 yarder against Lehigh last season that ended up being the difference in the game. He's got an excellent leg. Senior DB Kamau Dumas moves to punt returner (he returned kickoffs last year), while senior SS Marcus Leslie and freshman RB Pete Guerrerio form a dangerous tandem on kickoff returns. Dumas had an excellent game returning kicks last week with 40 yards in returns. 1. 3rd Down. One thing that Lehigh's defense did very well overall last week was hold Villanova on 3rd downs. As a fan, I would happily take a 5-for-12 3rd down conversion rate for Lehigh against Monmouth, and 0-for-12 would be a great recipe for victory. Keeping them short of the sticks disrupts their ball-control game and would help a lot. 2. Balance. Head coach Andy Coen talked this week about the need for balance on offense rather than becoming one-dimensional in the passing game like they were last week. Against a talented defensive team like Monmouth this takes on added dimension, for when they can sit back and let Mike Basile cherry-pick passing routes, that's not a good recipe for a win. Junior RB Dominick Bragalone will need to get a lot of tough yards this week, and keep the sticks moving. 3. Return Game. Both teams' return games are in the upper echelon of the FCS, and special teams could definitely turn this game one way or another - just like it did in 2012. If senior WR Gatlin Casey and senior DB Quentin Jones can break some good returns, that could be an enormous advantage that sets up Lehigh's offense. The days of the Monmouth game being a mismatch are over. The Hawks go toe-to-toe with Lehigh competitively, and it shows in the breakdown. It shouldn't surprise anyone anymore. There's also a concern that this could be a letdown game after the Villanova game. Last week, it was about national FCS attention and a battle of Top 25. For too many, a game against unranked Monmouth doesn't get the same level of attention or concern, perhaps because they remember the days when Monmouth was a non-scholarship school. That would be a terrible mistake. Monmouth, like Villanova, has 63 scholarships, and have national aspirations that would be very well served by getting their third straight win against a nationally-ranked Lehigh. I think this won't be a game defined by four or five big plays - I envision a game, like the last four contests between these two schools, that is surprisingly controlled with long drives resulting in touchdowns instead. Don't be fooled by Lehigh's dynamic offensive numbers - this could be a game where Lehigh is held under 30 points, and Monmouth has a good recipe for winning this game, like they did the last two: hold onto the ball, go out to an early lead, and beat up the Mountain Hawks physically as they run down the clock with the victory. If Mountain Hawk fans go into this game expecting a blowout, they're likely to be disappointed. If they go into this game expected a hard-fought win with Lehigh finding a way to secure a win in the fourth quarter, they might get that outcome. Regardless, I expect a fight. Good analysis and I admit that when I see "Monmouth" I still scoff, even though the last two years indicate otherwise. Lehigh put up 35 points on Villanova's vaunted defense, but your prediction for Monmouth is for 28 - seems a little light to me. I'm not worried about a "let-down" because it sure wasn't obvious last week that the team was "up" for Villanova. If anything, I expect Lehigh to be ticked-off; certainly Andy Coen is. Chuck tends to be pretty conservative on his calls when facing lesser teams.. Lehigh should roll for all the reasons he lightly covered.. The team was embarrassed last year at home against this team.. The skill players will have a field day.. Despite Coen wanting more balance, there is no stopping a high end passing team.